Picked from Kigali at your hotel or be picked from the airport drive you to Parc de Volcans. Dinner and overnight at the lodge or camp or similar. After early breakfast track gorillas. If time allows take visit to the communities. Dinner and overnight at the lodge or camp or similar. Taking another gorilla trek (this is optional – top up of $500) or you will visit Karusoke Research centre, or visit the golden monkeys or drive to Gisenyi, visit Ross Carr’s orphanage and Lake Kivu or climb the Visoke/Muhavura volcanoes, or trek to Dian Fossey’s grave, or visit the local school, community projects or walk to Lake Bulera. Dinner and overnight at the lodge or camp or similar. After breakfast in the morning cross border into Uganda by Kisoro side and drive to Kabale – lake Bunyonyi and overnight at Acadia Cottages/Habuharo Lodge/Overland Resort for budget facility. Morning take a boat ride on Lake Bunyonyi seeing plenty of bird life and visiting communities as they go their daily activities. Enjoy this Switzerland of Africa scenery. After lunch drive to Bwindi. Stay at Gorilla Forest camp/ Buhoma Homestaed/ Kitandara camp for up market or Community Bandas for low budget facility. Day for gorilla tracking in Bwindi. 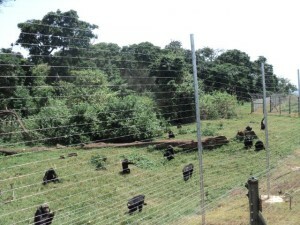 Tracking gorillas may take 5- 8 hours depending on the movements of these primates then transfer to Ishasha. Dinner and overnight at Ishasha Wildness Camp/ Ishasha –UWA Camp. Morning game drive looking for climbing lions. afternoon proceed to Mweya Peninsula and check in at Mewya safari Lodge or Jacana Safari Lodge or Institute Hostel for budget. Morning game drive. 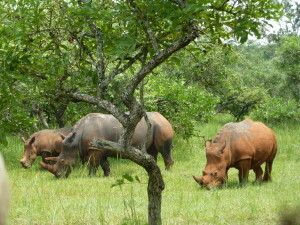 Evening game drive dinner and overnight and Mweya Safari Lodge/ Jacna safari Lodge or Institute Hostel for budget. Morning take Kyambura Excursion or Visit Maramagambo forest nature walk . Afternoon take a boat ride on Kazinga channel Dinner and overnight. Morning games drive and proceed to Kibale Forest National Park and overnight at Ndali Lodge or Fort Motel or Rwenzori view or Toro Resort. 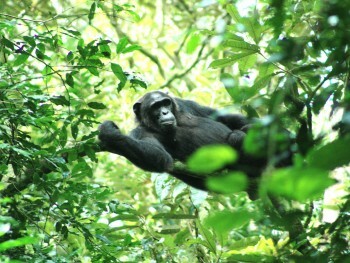 Track chimps in their natural habitat – kibale forest and in the afternoon visit Bigodi Swamp. Dinner and overnight. Drive to Murchison falls National Park. Dinner and overnight at Paraa Saari Lodge or Sambiya River lodge or Red chili camp for low budget facility. Morning game drive and afternoon take boat cruise to the bottom of the falls. Dinner and overnight. After breakfast drive to the top of the falls and continue to Kampala stop for souvenir shopping and proceed to Entebbe and overnight at Windsor Lake Victoria Hotel Entebbe Resot Beach Hotel Entebbe Botanical hotel or Sohphies Motel for budget and Entebbe Flight Motel for Low budget facility.